It's no secret I love the Madison River and everything about it. Sure, fishing it is a joy, but it also offers a variety of flows that can and will challenge the fly fisher from where it is born at the confluence of the Firehole and Gibbon Rivers, to the wide, even flowing expanses below Bear Trap Canyon - the lower Madison- and of course the 50 mile riffle that flows from Quake Lake to the braids above Ennis Lake. My favorite section is the long riffle that winds its way through a beautiful valley that fans out in benches to high mountains on either side that shelter all kinds of wild animals. Halfway through our trip we landed in the Madison Valley and as is always the case, I felt like I was home again. The river was higher than it has been in the last 20 years or so in July and its currents were loud and wild, music to my ears. I got there about mid-day, threw my stuff in the cabin and was on the water in 20 minutes. In 21 minutes I was into my first trout, a nice rainbow that took my brown serendipity like it was candy. The high, bright sun and warm air temps were no issue as I was wet wading and there was just enough of a breeze to keep things comfortable. The truth is, I rarely stepped in the water except to move up river and cool off. Most of the time I was on right on the bank working my way upriver, casting my fly straight up stream fishing it just off the bank to about 6-8 feet out. And the fish came often on that simple, size 16 brown midge pattern. After about an hour or so I went back to the cabin to wait for the others and unpack my things. As soon as they arrived, I told them the river was ready and waiting, so Paul grabbed his rod and was off to his favorite nearby pool. It wasn’t long before he was hooked up to a nice wild fish that was hiding in a slow eddy along a very fast, heavy riffle that the fish did everything in its power to get to and use the current to its advantage. That evening, after having a bite to eat and tying a few flies, we headed down river to a stretch that seems to fish well every time we hit it. When we got there the only anglers in sight were on the opposite bank so we had the long stretch all to ourselves. We spread out over a quarter mile or so of bank and after a slow start, as the sun dropped in the sky fish began to rise steadily from the edges of the river out to just along the really fast currents. If there was a rock, pocket, or seam, a fish or two worked the surface. With all the caddis in the air, I tied on an Iris Caddis and took several dozen fish over the next two plus hours, mostly rainbows, before it was too dark to see my fly. I spent the entire next day fishing the Madison while Paul and Steve went over to the Henry’s Fork to drift with a guide. I hit a whole bunch of spots on the river during the day and all of them fished well. Again, the top fly was a #16 brown serendipity fished alone with varying amounts of split shot placed above it about 6-8 inches. As long as I got it down near the bottom, fish took it. Late in the day I went to a public boat ramp and fish up river. There were caddis hatching, Little Western Green Drakes or “Flavs” duns and spinners in the air and on the water, and rusty spinners. The fish were finicky, with no single insect on the menu so I was continually changing flies to match what a particular fish was feeding on. I took quite a few fish, but had to work much harder for them than the night before. Shortly after I got back to the cabin, Paul and Steve returned with big smiles having each having caught a single big rainbow, 22-23 inches, on hoppers. The next morning we were all up early and after breakfast Paul and Steve headed back to the Henry’s Fork for a hoped for repeat performance sans a guide and drift boat, and I followed them over the pass. We got to the upper ranch parking lot around 9:30AM, and after gearing up proceeded to walk the bank down river. It was still cool with muted sunlight through high thin clouds and barely a breeze. Tricos danced in the air over the water and along the bank. 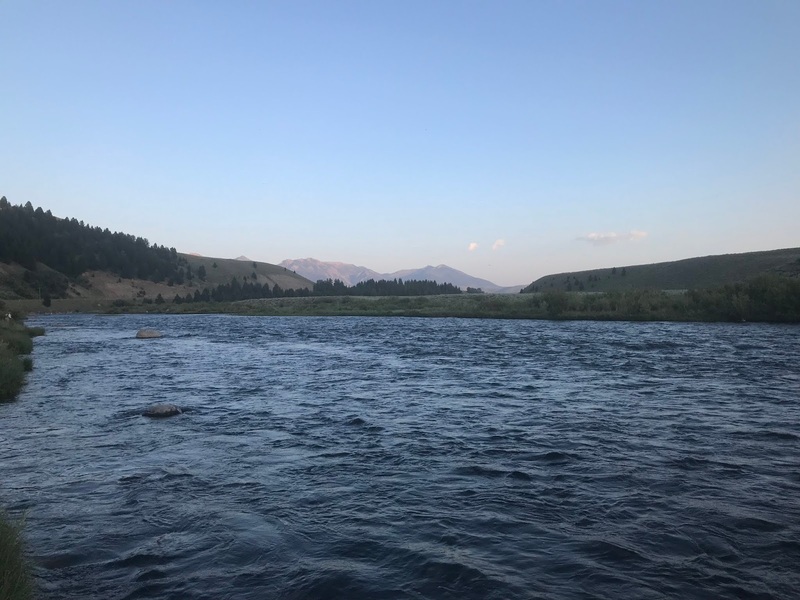 Early on, small fish rose everywhere one looked across the broad expanse of flowing water – the river on the ranch is a wide, uniform depth of flowing cool water whose surface is continually changing from the thick grasses undulating below in the current. After walking for some time I stopped to watch the water while the others kept going. 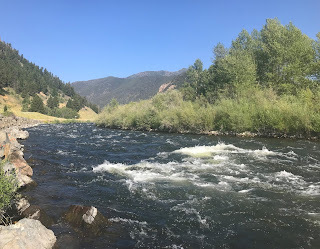 There were a bunch of anglers down river and since there were plenty of fish rising where I was and no one within a couple hundred yards up or down river, I stepped into the river and began watching and looking for larger rising fish. By now there were pale morning duns and also a few flavs hatching. I tied a #22 trico spinner to the end of my 15 foot leader, the last of which was 30 inches of 5X tippet. I spotted what looked to be a decent fish rising in a long seam formed by a submerged rock and slowly worked my way out to where I was within a safe casting distance down and across from the feeding trout. 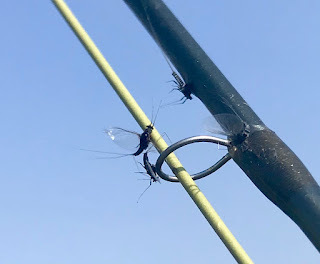 After making a short cast to make sure my leader and fly landed on the water properly, I made a few rod strokes to let out enough line and then dropped the fly above the fish. It drifted to its right and went untouched. I made a few more casts over the fish, and it kept rising to everything but my fly. Fortunately, that was not to be, as over the next 3 hours or so fish rose throughout the river. Literally everywhere you looked, up, down and across the river there were sips, and splashes and tell-tale rings from trout feeding on top. Most of the fish were small, maybe 6-8 inches long, which were easy to make out by their quick, splashy rises. Other rises were slow, nose-dorsal-tail rises, while others, the largest fish, poked their noses out and opened wide, shut, and then disappeared in a split second leaving a series of ever widening concentric circles. The trick was finding one of these larger fish and getting close enough to cast without putting them down. Your first cast had to be good, too, or a second chance was out of the question. I not only managed to get close and make enough good casts to catch about 15 fish. 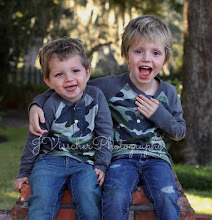 They ranged in size from 8 inches to about 16 inches. The smaller fish were so aggressive at times that they would dart up take the fly as it hit the water above a larger fish that my fly was intended for. I also lost quite a few after hooking up as the weeds are thick that once a fish managed to get tangled up in them you couldn’t turn their heads and then the end of the line would stop shaking. I’d wade over to retrieve my fly only to find it stuck in the stem of a frond of grass and the fish long gone. All of the fish I took came on the pmd/flav snowshoe pattern and although I didn’t hook any monsters, it was a very good day wet wading in the big river taking in all that it has to offer. I see you took a picture of one of my favorite stretches to nymph...THANKS!!! !